Happy New Year 2018! The year of Mastery and Love! I have seen different posts on what this year will be about. Intuitively I feel that this year is about Mastery and Love. I feel it is always important to set your intentions each New Year and forget your resolutions. Intentions are a choice we make that signals the Universe to help us create from a state of BEing, Grace, and clarity. Resolutions are something that we set and often, when we don’t achieve them, create a sense of failure. It is by definition a tradition in which a person resolves to change an undesired trait or behavior to accomplish a personal goal or otherwise improve their life (Wikipedia). When we write our Resolutions for the year we are attempting to ‘do’ something. And unless we come from our BEing level we aren’t likely going to make any lasting changes. We often review all the things wrong with our outer self and set goals such as weight-loss, health, fitness and addictions and look for ways to control, change or fix ourselves. We look at how we can approach our ‘problems’ differently to make lasting changes. However, we have to ‘own’ our problems, take responsibility for our fears and choices. When we have something we want to change, like our weight because it impacts our health, we have to know our motivation and approach it understanding what the underlying cause is. This is where we need to dig deeper than just using our mental will to change. We have to figure out what the cause of the weight gain was initially, yes, from the beginning. Like in the act of stopping smoking we can use our will to lose weight however if the underlying cause is still present whatever we have tried to stop – or an alternative addictive behavior – will continue. And I am calling this underlying cause ‘fear’. And so we ‘do’ things out of fear rather than ‘Being’ – which is how we express ourselves – so if there is fear while we are BEing we can recognize it and change it to how we would rather BE. And it is our fears that will continue to create our addictions to food, sugar, alcohol, smoking, or whatever else we do that we don’t exercise our will over and our will loses its initial energy because the fear is still there! This is why mental ‘fixing’ doesn’t work. Once we reveal to ourselves the underlying fear it is very likely that we won’t need will power to ‘stop’ a particular behavior since stopping that behavior will be seemingly effortless. When we come from a place of BEing we are first connecting with the Infinite and Authentic Self within us. We are acknowledging our True Self. Our intentions then come from within us and have a sense of Connection to our Inner Self. We can intend to Feel more Love and Compassion for ourselves and others. We can intend to share Who we are more to the World. And since our intentions come from within us, not outside of us, we can shift towards a BEing level. And we can make changes outside of us as long as we approach the change from an inner place of how it makes or will make us feel, instead of what we can ‘do’ differently. Does this make sense? When we come from a place of Love instead of fear we will always create what it is we desire most. Fears create more fear. Love is the energy and vibration of the Universe. However we can’t just love ourselves thin because we are still viewing the problem as outside ourselves and that we are ‘doing’ something wrong. So as we enter the New Year and want to celebrate with creating New adventures in our lives let’s begin by asking ourselves how we want to Feel this New Year and bring more consciousness into how we are feeling by focusing on Loving Energy – the Energy that is our True Essence. When you consider 2018 and a New You I invite you to consider the vibrations of 2018 as Mastery and Love. What would you like to Master this year? Approach it from a BEing level instead of ‘doing’ level. If you feel the need to change things within your life then contemplate how you express your consciousness around this area of your life. How would you like to approach it differently from all the other years? Examine how you feel about yourself and what you are wanting to change, heal, fix or control. If you knew you were perfect right now, if you knew that you are the one judging yourself and just perceiving others as judging you, would you approach how you see yourself differently? If you came from a loving place that held no fear – as in needing to fix, control or manipulate – could you shift your motivation towards what you want to change? Often our motivation is fear based so shifting this motivation would require you not seeing the ‘problem’ but knowing how to best express Who You Are. When we have the courage to face our inner fears – feeling unworthy, abandoned or separate – then we recognize how we have been living our lives through these fears. Addictions like sugar and emotional eating come from a fear. Sugar can be understood when we review our childhood and see that we were often rewarded with sweets; so we based our worthiness and value on food. These are the ways we must contemplate the changes we desire to make. 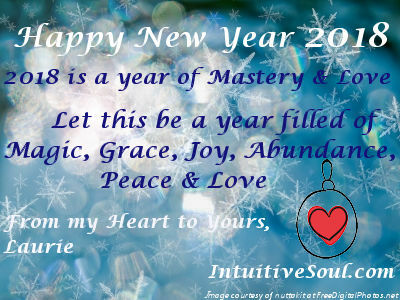 This entry was posted in Blog and tagged Being vs Doing, Happy New Year 2018, intentions vs resolutions, Intuitive Counseling, intuitive counselor, Laurie Huston, Love over Fear, New Year's Intentions 2018, Setting Intentions for New Years, Tom Campbell, Year of Mastery and Love. Bookmark the permalink.